The best way to experience New York's most iconic bridge is with our fun and local tour guides. Enjoy 360-degree views of New York from atop the Brooklyn Bridge, then take in the Manhattan skyline and the grandeur of this Historic Landmark from Brooklyn Bridge Park. Discover historic Brooklyn riding past trendy DUMBO and return via the Manhattan Bridge and through the streets of Chinatown. This tour is suitable for all ages and levels. Explore bike-friendly New York City like you never imagined! This guided tour departs from Pier 17 location, on 93 South St. at 11 AM. From here it's a short ride to City Hall Park where you will pass the oldest city hall in the country before crossing the iconic Brooklyn Bridge. 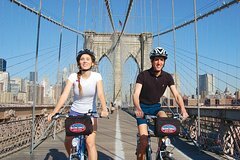 In Brooklyn, you will ride through the historic Brooklyn Heights and its many brownstone row houses, and of course to the romantic promenade where you can enjoy stunning views of lower Manhattan. You will stop at Brooklyn Bridge Park before returning to Manhattan and over the East River via the Manhattan Bridge. You will also ride through bustling Chinatown on your way back. Our enthusiastic guides will lead the way while sharing their knowledge and best vista points. It is recommended you arrive at least 15 minutes before the scheduled departure for bike fitting and orientation.